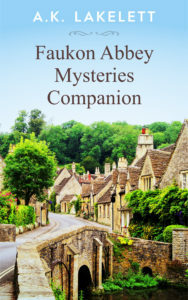 Get “Faukon Abbey Mysteries Companion” book for FREE! The Faukon Abbey Mysteries take place in the small town of Faukon Abbey, Devon. The Companion tells you more about the history of the town, as well as surrounding area, with pictures and maps. It also has stories from The Abbey Chronicle and a longer short story, something to read while sipping that nice cup of tea! Join my VIP Readers group and you’ll be first to know when the third book in the Faukon Abbey Mystery series comes out. But since I write slow, I may also occasionally email you about books by other authors I think you may like. To get your FREE book, fill in the your email address below, and check for e-mails coming from aklakelett@faukonabbey.com . Please make sure you confirm your subscription by responding to the email coming in a few minutes. Then I’ll know where to send it! If you don’t see the email, please check your junk mail folder. Fill in to get your Free Book now! I’d love to hear from you, please connect with me on Facebook!